WARNING The article contains a couple spoilers about last night’s ‘Mad Men’ on AMC. If you’re a fan of the show, come back once you’re watched the episode. But these posts are about a specific element of New York history from the 1960s and can be read even by those who don’t watch the show at all. You can find other articles in this series here. In trying to contrast the life-altering decisions made by two of ‘Mad Men’s central characters, the writers certainly did an excellent job last night in choosing two appropriate and familiar locales. Don Draper (with Megan in tow) made a last-ditch effort to win over a difficult client by dining at the Tower Suite in the Time & Life Building. (The offices of Sterling Cooper Draper Pryce were actually several floors below.) 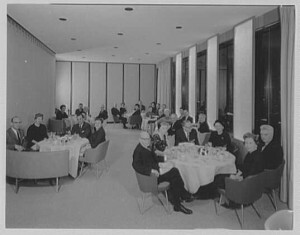 The restaurant on the 48th floor served as an executive dining room during the day called the Hemisphere Club, one of a number of elevated lunch spots in midtown Manhattan. The destination for businessmen looking to impress — waiters were dressed as butlers — was opened by George Lang of Cafe des Artistes fame in 1961. Peggy Olsen, meanwhile, had a more personal dilemma to attend to downtown in the heart of Greenwich Village where she’s seen much of her personal growth. She’s presented with a decision to make over dinner at Minetta Tavern, a corner Italian restaurant on MacDougal Street at the foot of small Minetta Lane. This was the former location of The Black Rabbit, one of Greenwich Village’s best known speakeasies, operated by Eve Addams. Her infamous tearoom Eve’s Hangout right up the street was one of New York’s first lesbian hangouts. The Black Rabbit switched to proper Italian cuisine in 1937. With the Tower Suite long gone, you can no longer enjoy its faux-butler service, but Minetta Tavern was renovated and reopened in 2009 by restaurateur Keith McNally. ← Partners In Preservation: Help out a NYC landmark!